China’s civil aviation administration has grounded Chinese-operated #737MAX aircraft. 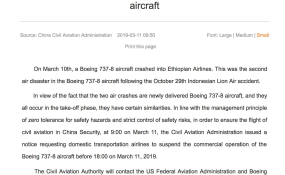 “Although we don’t yet know the cause of the accident, we had to decide to ground the particular fleet as extra safety precaution”, read the press release that Ethiopian sent to ENA. Tewolde said a routine maintenance check hadn’t revealed anything before takeoff. “As it is a fresh incident, we have not been able to determine the cause. As I said, it is a brand new airplane with no technical remarks, flown by a senior pilot and there is no cause that we can attribute at this time,” Tewolde said.